Most of the attention in the graphics card space is focused on the GTX 1080 right now, with benchmarks revealing an extremely powerful card at a reasonable price point. But not everyone has $600+ to spend, which is why many people are eyeing off the GeForce GTX 1070 instead. Ahead of the launch in just under a month's time, Nvidia has released the specifications of the GTX 1070. As expected, the graphics card features a cut down GP104 GPU, featuring 1,920 CUDA cores (down from 2,560 on the GTX 1080) along with 120 TMUs and 64 ROPs. Boost clock speeds have also decreased, down to 1,600 MHz from 1,733 MHz. The memory system sees 8 GB of standard GDDR5 connected through a 256-bit bus. Nvidia has also confirmed the card's TDP, which sits at 150W, as well as its array of connectors: three DisplayPort 1.4 ports, a single HDMI 2.0b port, and a connector for the company's new SLI HB bridge. 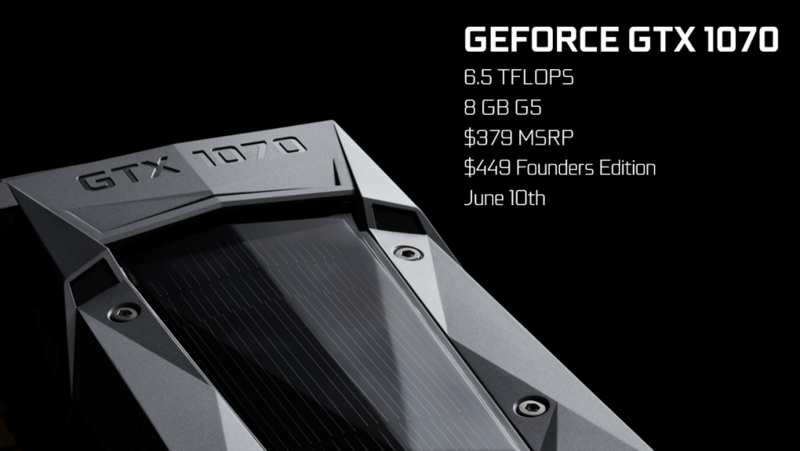 The GTX 1070 will become available on June 10th for $449 as a Founders Edition card, with board partners set to release customized designs at a lower MSRP of $379 a few weeks later. Nvidia claims this card will slightly outperform the GeForce GTX Titan X.